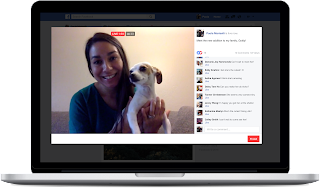 Facebook social media introduced this live streaming video feature last year, where each and every user on Facebook has the option to upload and stream videos live. The streaming was working very well, but it was only for those using mobile phones. Now, the trend is that Facebook has activated live streaming for PC users. In other words, you can now live stream using your laptops or desktop computers. According to Facebook chat media, "desktop or laptop computers provides platform for a stable camera setup which can go a long way in making so many types of Facebook Live broadcasts beneficial — from Q&As to vlogs to tutorials to any broadcast from anyone who is not on the move. You can actually start live stream on your Facebook Account using your PC. First , login into your account in case if you are logged out on your pc. Then click on “Live Video” which is located at the top of News Feed or Timeline, now follow the prompts in order to add a description and same time your choose your audience. That’s all for now, stay tuned for more information, and share this post on Facebook in order to let your friends know about. Someone might be waiting for this feature for long, so do the person the favor by sharing. Thanks.